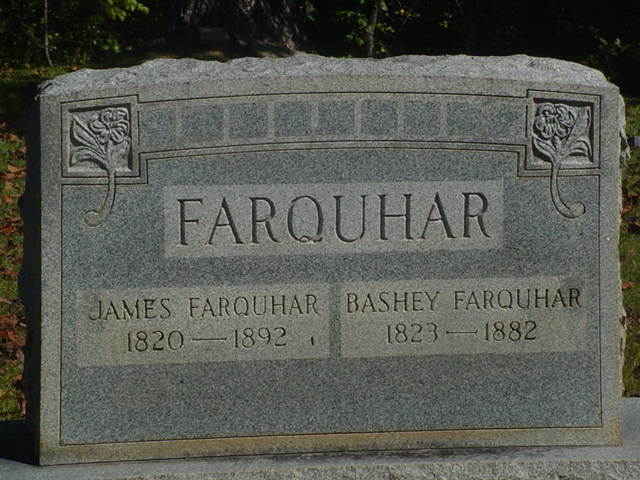 My 3rd great-grandmother was Basheba McGuire Farquhar. Details on her life are limited and not yet adequately sourced. I found her name almost by accident; I wrote about that serendipitous occurrence in a blog I called Meet the Farquhars. Because individual names are not listed on census records for the years prior to 1850, it is often difficult to trace female ancestors’ families because they are listed only as age-categorized tic marks. Although internet searches have given clues that her parents were likely Amos McGuire and Sarah [Sally] Langston, I have not yet found documentation to support that conclusion. However, we are beginning to see evidence via autosomal DNA samples from several of Basheba’s descendants that we are genetically related to Amos and Sally. Much more work remains to be done on this family connection. 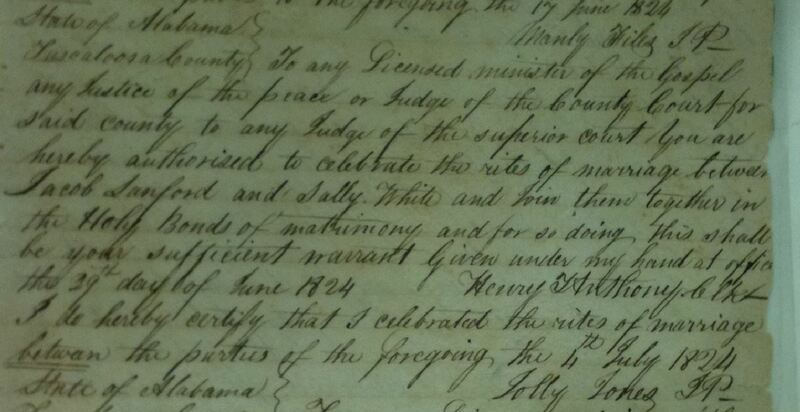 A search of Ancestry.com provided a marriage index that listed her marriage to James Farquhar in Tuscaloosa County, Alabama on August 22, 1833. The 1860 census lists the following children: Sarah [about 1833], Polly [about 1835], Andrew J. [ about 1837], Martha [about 1839] and James [about 1841], Elizabeth [about 1843] and Sis [about 1848]. The pattern of a birth every two years, except for Sis, would suggest these are their children; the break in the pattern possibly indicates the death of a child. 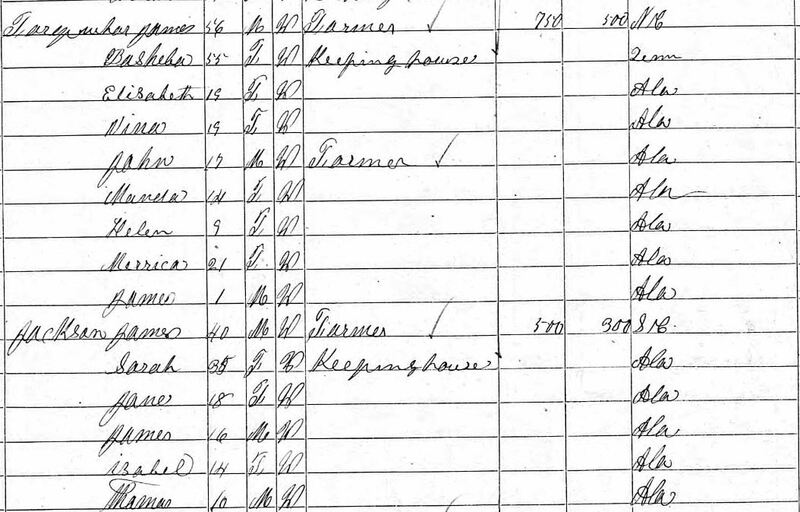 This census record states Basheba was born in Tennessee about 1813. This evidence would place both James and Basheba’s ages at about 20 years of age at the time of their marriage. The 1870 census adjusts the probable birth years for James and Basheba to about 1814 and 1815 and adds the names of more children; it was also the piece of evidence that connected Basheba to my great-great-grandmother Sarah Farquhar Welch. The names of the children took more than just this one record to decipher them but here are the eventual names of their children: Lavina “Vina” [about 1851], John [about 1853], Amanda [about 1856] and Cornelia Helen [about 1861]. The name “Merrica” stands for America who had been listed as Sis in the 1860 census. James is the son of America. Below James and Basheba’s family is the listing for the family of daughter, Sarah Jackson, who remarried following the 1862 death of her husband. The reason I had been unable to find any of the children was two fold: the enumerator listed them by the surname of their stepfather. Additionally, Bashuba had been listed by her middle name of Jane and Mary E had been listed as Isabella. Fortunately, I had found their father’s administration files that gave the full names and ages of his children as Bashuba Jane , James Alexander , Mary Isabella  and William Thomas . By the time of the 188o census, James and Basheba were enumerated with only themselves and their grandson, James Hall Farquhar. Basheba, who was listed on the 1880 census and her headstone as Bashey, was likely called by that name. 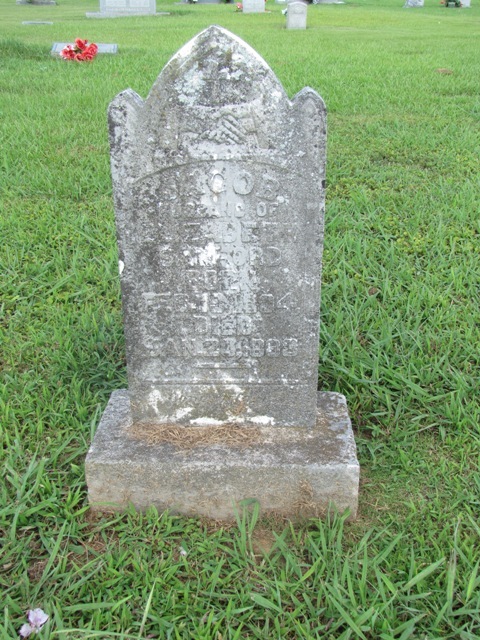 She died about 1882 in Fayette County, Alabama and is buried at Mount Pleasant Baptist Church Cemetery on land family tradition indicates was given by James and Basheba to the church for the purpose of providing burial plots. The date on her headstone for her birth is not accurate based on the evidence of census records over time and the logic of her marriage age in 1833: the headstone birth date of 1823 would have her ten years old at the time of her marriage and the birth of her first daughter [the same logic would have been true for James]. Based on cumulative evidence, her birth should have been between about 1813 and 1816 and the death date is likely reasonably accurate, although James did not remarry until January 1886.